The QDH20 provides encoder feedback in standard industrial mounting configurations with superb mechanical and environmental protection. Outputs consist of a quadrature A & B with reference pulse Z as a standard feature. The output can be configured with either the industrial standard 5 to 26 volt OL7272 line driver or open collector outputs. The QDH20 features two heavy-duty bearing sets holding the output shaft, and two more bearings along with an integral flexible spring mount to isolate the working pieces of the encoder from mechanical stresses. 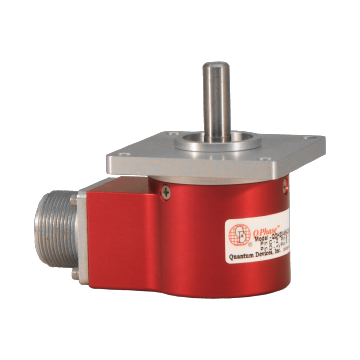 CLICK ON THE LINK BELOW for more information on the QDH20 Size 20 Industrial Encoder from Quantum Devices.